18 November 2016, at 6:00a.m. EU, SPAIN - European markets have been steady over the last three weeks. Meanwhile, in the Spanish market, supply continues to push hard, writes Mercedes Vega, General Director for Spain, Italy & Portugal. 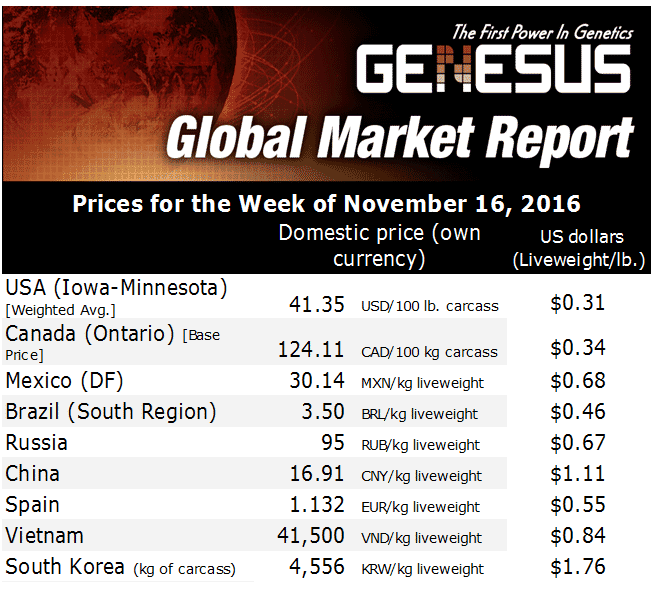 The price in Spain is at the lowest EU level, with a price of 1,132 € / kilo liveweight (Germany 1.18 € / kilo - 10 per cent higher than a year ago). Nonetheless, we have a higher price than a year ago, which was 1,007 € / kilo liveweight. There is a strong hog’s offer with animals that are placed in similar weights to those of a year ago on around 111.04 kg liveweight (about 85 kilos carcass). A month ago, we were 1.3 kilos less. 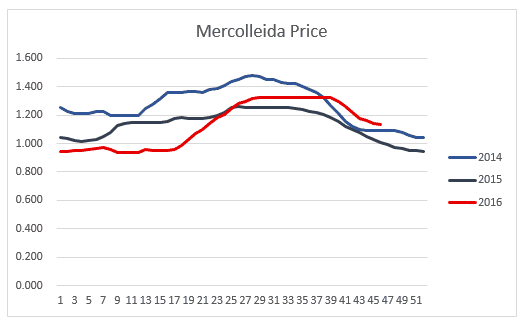 Over the last month, the Mercolleida's price has dropped 11 per cent. Slaughterhouses are killing at higher volume because they are getting more pigs and trying to recover some margins. Producers continue to deliver more hogs on the market since they are growing faster as a consequence of both temperate weather and lower prices on grains. Pig producers are incorporating more wheat and soy to the pig’s diet. The average annual cost of production per month in September is 1.03 € / kilo liveweight, while the average sale price is 1.05 €, according to data from SIP Consultors. The market trend continues to be consolidation in large companies. We can say that in the hands of 22 companies is more than 40 per cent of Spain’s pig production. Among the 10 largest companies, there are more than 700,000 sows. Integration has been successful in Spain for continued production, lower cost of production, and agreements with slaughterhouses. There is another change in terms of terminal boars to produce market hogs. Less than a year ago, few packers wanted to hear about producing with terminal boars other than the Pietrain. At this point, there is still Pietrain demand, but some packers has started focusing on animals with a higher meat quality value. Even those that already produced with 50 per cent Duroc, either in purity or synthetic lines, are demanding more carcass and meat quality, even going so far as to claim 100 per cent Duroc as final product in a small part of their production. All of this is under a cost structure that can be absorbed in the price of pork. At this point, we have to differentiate between domestic demand and export markets. In the first case, it seems that there is a niche for that market that had disappeared with the financial crisis. This disappearance was as a consequence of the Spaniards’ low purchasing power and the lower prices from the Iberian pork. But now that the Iberian is getting momentum and the financial situation seems to be improving, this market niche for higher quality meat show that the consumer knows how to appreciate it. As for exports, there are a lot of destinations that have demand (and pay) for an extraordinary meat quality other than the ordinary product that was being done so far. At Genesus we have perceived this market trend more frequently. There are more Producers / Packers who are interested in trying Genesus Duroc. This is being seen with increased sales to try out our product from Canada. Regarding international markets, the export volume of Spain in 2015 compared to 2014 has increased by 14 per cent in the EU and 28 per cent to No-European countries, representing 17.6 per cent increase in total exports, which accounted for 1.3 million tonnes, although the value of exports has decreased by 10 per cent due to low prices. The growth of Spanish exports in the first half of 2016 represented 14 per cent in volume and 26 per cent in value of increase compared to the same period last year. The most important growth has been to China with 147,543 tons, surpassing markets like Italy, France and Portugal. In addition, exports to South Korea, Hong Kong, the Philippines, Taiwan, Vietnam, South Africa, the USA and also Eastern Europe have also increased. In August 2016, China authorized importation from 5 new Spanish packing plants. There are 26 companies already able to export to this destination. 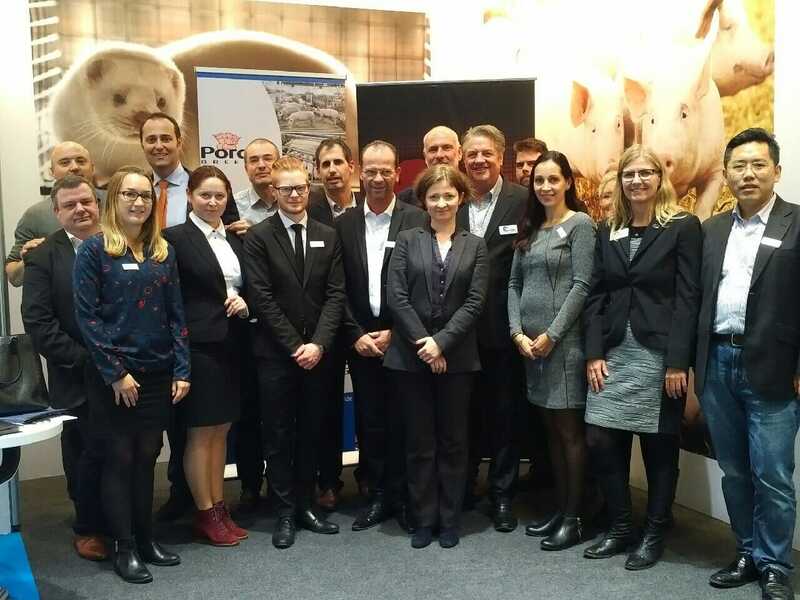 Genesus is currently at the EuroTier Livestock Expo in Hanover, Germany! Please visit us at the Genesus Booth, Hall 15 Stand E30.